Seeing is Believing This sample manual to teach Core Essentials for Office 2007 is in MS Word format. 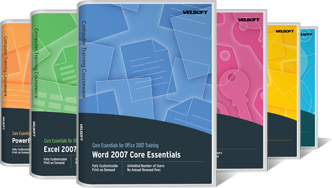 An ideal bundle of courses for instructors to teach the essential Office 2007 applications to Business Professionals. With the Core Essentials bundle of courses, you get everything you need to begin training right away. Each course comes with Student and Instructor Manuals, Pre-assignments, PowerPoint presentations and more! Having to take the time to develop your own training materials means less time actually doing what matters most, teaching. We understand the time and effort it takes to develop proper training solutions that work. This is why we give you the ability to fully edit our material. Print off as many copies as you need. Rebrand the materials with your own logo. And only pay once!